The classic design and soft golden hue of this natural cedar accent table pairs nicely with nearly all of our Rustic Cedar chairs and benches. Use it for books, flower arrangements, games or tea-time. This table also makes a great children’s table. Solid cedar construction ensures years of carefree use and enjoyment. Cedar is also naturally aromatic and resistant to decay, insect, and weather damage. When left untreated, the color weathers gracefully to a soft, silvery grey. The Rustic Cedar Round Accent Table is 27 round and 18 tall. 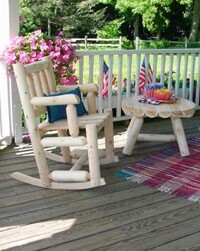 Pictured with a pair of Rustic Cedar Porch Rocking Chairs (sold separately). Assembly required. Extra shipping charge may apply 25 lbs 1 pkg.